Subscribe to the Paper-Cutting Lovers Newsletter and you will enjoy a world of paper cuttings! You will automatically receive newsletters from Tongs-Paper-Cutting.com, when new cutting patterns are uploaded, the news about paper cutting. It is the best paper cutting websites to go to see incredible paper cuttings and new cutting ideas. 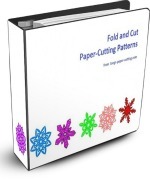 As a special thank you gift when you sign up for Paper-Cutting Lovers Newsletter, and join us as part of the paper cutting family, I am giving you my book - 32 beautiful Fold and Cut Paper Cutting Patterns - for Free! Enjoy this collection book, and it can be used as many times as you want, which you're sure to love. Simply enter your name and email address in the box below and I'll email you the download page for the ebook. And you can look forward to receiving the latest info from Tongs-Paper-Cutting.com! Subscribing is easy and free. Just enter your email and name below to get your gift! P.S. Tongs-paper-cutting.com now is part of Tong's Art Studio website. You'll start to receive newsletter from Tongs-art-studio.com after September 20th 2015.